Viktor Yanukovich’s isolation: The Ukrainian president may be losing the oligarchs and the people. Why Viktor Yanukovich may not survive this revolution. 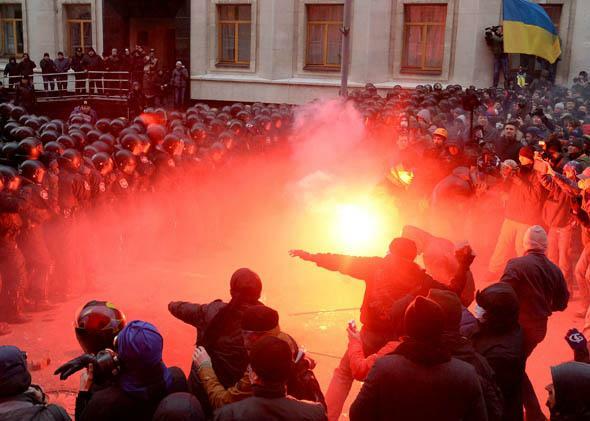 Protesters clash with riot policemen outside the president’s office in Kiev on Dec. 1, 2013. Since his election in 2010, Ukrainian President Viktor Yanukovich’s power has rested on two pillars: public apathy and wealthy donors. The hundreds of thousands of protesters who packed the central squares of Kiev on Sunday are the most visible symbol of the dissatisfaction with the strongman’s rule. But Yanukovich may have lost that other constituency—Ukraine’s small class of oligarchs—as well. If that proves true, the Ukrainian leader’s government may be living on borrowed time. Yanukovich’s immediate troubles go back to Vilnius—specifically, his abrupt decision at a summit in the Lithuanian capital on Nov. 30 to back away from an association agreement that would have brought Ukraine closer to the European Union. In so doing, Yanukovich appeared to be currying favor with Russian President Vladimir Putin, who had pressured Kiev with a mixture of promises and threats to stay within Moscow’s orbit. Three days later, 100,000 people took to the streets, to protest Yanukovich’s decision. The sight immediately conjured images of the so-called Orange Revolution, a massive display of people power in 2004 that ultimately overturned Yanukovich’s fraudulent election. The massive crowds calling for his resignation must come as a shock to Yanukovich and his small circle of cronies. They had come to believe that Ukrainians were sick of politics. Any protests that occurred during his rule always melted away before making a difference. The conventional wisdom was that the public was too disillusioned after the failures of the Orange Revolution—poisoned by political squabbling, corruption, and back-stabbing—to protest anything. And they may have remained apathetic if it hadn’t been for Yanukovich’s own missteps. According to Vitaly Portnikov, a well-known Ukrainian journalist, nearly everything hinged on Yanukovich signing on the dotted line. Had he inked the EU deal—as until recently many believed he would—nothing in Ukraine would have changed. People would have continued as they had in recent years, despite allegations of official corruption and self-dealing. They may have lamented the continued incarceration and persecution of Yulia Tymoshenko—but they wouldn’t have suddenly staged mass rallies calling for her release. Yanukovich would probably have even been assured re-election in 2015. Yanukovich’s chief motivation has always been self-preservation. He clearly believed that not following through on the pro-European agreement was in his best interest, but he misjudged. Because his refusal to sign—and the tilt toward Moscow that implied—has changed everything. Within hours, riot police dispersed a crowd of peaceful, mostly young, activists on Independence Square in a bloody crackdown. Videos of the police’s use of force quickly went viral, galvanizing more than 10,000 protesters to show up Saturday. In the scrum of events that followed, rumors swirled that Yanukovich’s chief of staff, Serhiy Lyovochkin, had resigned in protest. A powerful player aligned with oligarch Dmytro Firtash—perhaps Ukraine’s wealthiest businessman—Lyvochkin also controls one of the country’s most popular television channels, Inter. When its coverage abruptly ended its censorship of the pro-European protests and devoted an entire half hour on Saturday night to brutal footage of the crackdown, it suggested Lyovochkin had abandoned the president. With sympathetic interviews of people preparing for Sunday’s protest, the program seemed to encourage viewers to join them. Other major media outlets—all of which are controlled by the country’s oligarchs—have followed Inter’s example. Segodnya, a popular newspaper controlled by oligarch Rinat Akhmetov, announced the protests online on Saturday as well. The 1+1 channel, controlled by another Ukrainian business group, started covering the protests Sunday. At the same time, the country’s feisty Internet media have been suffering repeated denial of service attacks. Today, Ukrainian officials announced that the president has not accepted Lyovochkin’s resignation, further obscuring the situation. But the sudden shift in media coverage demonstrated how radically Ukraine’s political landscape is shifting. Six months ago, a dozen Ukrainians would have been unlikely to rally for the pro-EU agreement. What changed? Certainly, Friday’s crackdown provided a spark. I lived in Ukraine for 16 years and never saw such brutality on the part of law enforcement. But while awful, that alone wouldn’t have prompted half a million people to take to the streets. For that, Yanukovich may have no one to blame but himself. The president’s own propaganda machine spent months touting the benefits of the EU agreement, raising the hopes of millions of Ukrainians who want to see their country as part of a European, not Russian, frontier. Whether Yanukovich intended to sign the accords or was negotiating with Putin all along is irrelevant now. Dashing the hopes of millions of people is a dangerous game. Nor were these hopes likely limited to the general public; Ukrainian oligarchs no doubt saw a better future themselves in Europe than Russia. For starters, they all live in Europe anyway. They spend their money and educate their kids in London, not Moscow. More importantly, they want preferential access to European markets for their industries, as well as the legitimacy that comes from the association. Ukrainian businessman Viktor Pinchuk, for one, spent lavishly in September to invite world leaders to Yalta to promote Ukraine’s European ties. That brings us to the third pillar on which Yanukovich built his power: fear. Since his election in 2010, he has arrogated control over the courts, police power and the parliament, using them to lop off large chunks of other people’s property and wealth for himself. The grandiose and tacky palace he built north of Kiev is a testament to that greed, as is the meteoric enrichment of his family and friends. The imprisonment of Tymoshenko is a constant reminder of what could befall anyone who dares to become a political enemy. Until now, with only a few exceptions, no one among the oligarchs has dared to step too far out of line, even as he chipped away at their own wealth and power. Which is the other thing that changed in Vilnius: Yanukovich looked weak. Unlike at home in Ukraine, he was on the defensive. His sudden about-face forced him to explain himself. He admitted to weakness when he complained of his difficulties negotiating with Putin, which was capped off by ultimately bending to the Russian leader’s terms. When fear of a strongman begins to melt, so does his power. Seeing hundreds of thousands of protesters on the streets of Kiev may have emboldened members of the country’s elite to begin to move against the president. Ukraine’s rapacious oligarch’s may—for the first time—have found common ground with their increasingly impoverished compatriots in getting rid of a tyrant. The next telltale sign will be if the oligarchs—or their media monopolies—begin to call for new elections or political consensus in parliament that freezes out Yanukovich. What would have been unthinkable a short time ago could now be in the offing. Five members of parliament associated with Lyovochkin have quit Yanukovich’s party. There are rumors that at least 20 more may be ready to follow. Pressure from the street might make all the difference. The Ukrainian street has once again proven its mettle, and the protests show no sign of abating. They’ve even captured Kiev’s city hall and two other central buildings. It’s often said that Yanukovich has a deep fear of street protests. Right now he may be as worried about a small clutch of the country’s superrich. Mary Mycio is a Slate contributor and author. Her most recent book is Doing Bizness: A Nuclear Thriller.